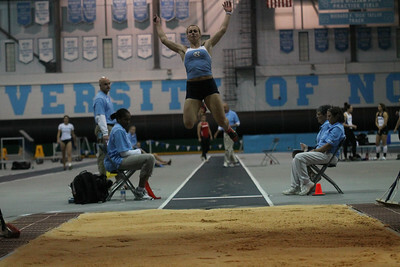 The Daily Tar Heel's photo coverage of Carolina varsity sports. Brice Johnson (11) looks to pass around Florida State's Jarquez Smith (5). 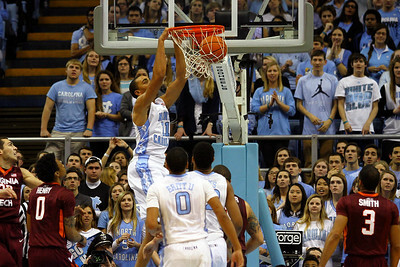 UNC sophomore forward Kennedy Meeks (3) goes up for a layup. UNC junior forward Brice Johnson (11) dunks the ball. UNC senior forward Jackson Simmons (21) attempts a field goal, but is blocked by Virginia Tech junior forward Shane Henry (0). UNC junior guard Marcus Paige (5) makes a three-pointer. UNC head coach Roy Williams picks junior guard Marcus Paige (5) up after he fell out of bounds. 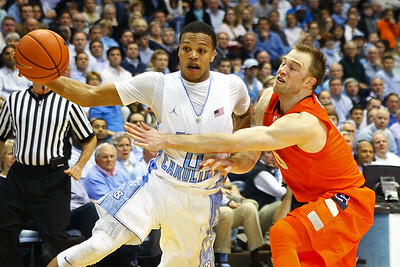 UNC sophomore guard Nate Britt (0) blocks Virginia Tech freshman guard Ahmed Hill (13) from making a three-pointer. Virginia Tech junior forward Shane Henry (0) dunks the ball while UNC sophomore forward Kennedy Meeks (3). UNC freshman forward Justin Jackson (44) attempts to block Virginia Tech senior guard Will Johnson (25) from making a three-pointer. UNC junior forward Brice Johnson (11) attempts to block as Virginia Tech freshman guard Jalen Hudson (23) goes up for a layup. UNC junior forward Brice Johnson (11) smiles as Virginia Tech senior guard Will Johnston (25) puts his shoe back on after it came off during play. Johnston was injured twice during the game, causing the game to be stopped three times for medics to clean the court. UNC sophomore forward Kennedy Meeks (3) attempts a field goal while Virginia Tech freshman guard Malik Müller (1) blocks. UNC junior forward Brice Johnson (11) dunks the ball. 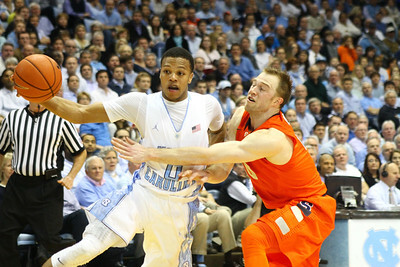 Johnson scored 12 points for the Heels. UNC junior guard Marcus Paige (5) runs the ball down the court. Paige scored 7 points and had 6 rebounds for the Heels. UNC junior forward J.P. Tokoto (13) dunks the ball. Tokoto scored 10 points for the Heels. UNC sophomore forward Isaiah Hicks (22) attempts a field goal while Virginia Tech senior forward Christian Beyer (22) and freshman forward Satchel Pierce (21) block. UNC freshman forward Theo Pinson (1) attempts to rebound the ball before Virginia Tech senior forward Christian Beyer (22). 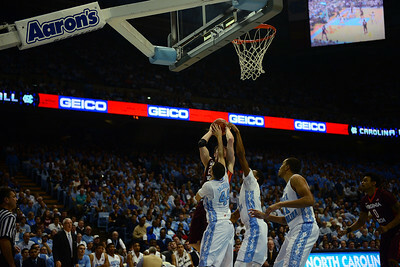 UNC sophomore forward Kennedy Meeks (3) goes up for a layup while Virginia Tech freshman guard Malik Müller (1) blocks. UNC junior forward J.P. Tokoto (13) makes a jump shot. UNC junior forward Brice Johnson (11) scores the first basket of the game for the Heels. UNC juniors Marcus Paige (5) and J.P Tokoto (13) fight for a turnover. UNC junior guard Marcus Paige (5) fights with Virginia Tech senior guard Will Johnston (25). UNC junior forward J.P. Tokoto (13) dunks late in the second half. UNC junior forward J.P. Tokoto (13) scrambles for a loose ball. 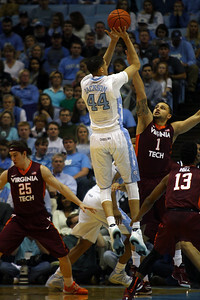 UNC freshman forward Justin Jackson (44) makes a jumper over Virginia Tech freshman guard Malik Müller (1). UNC junior guard Marcus Paige (5) takes a three-pointer. UNC junior forward J.P. Tokoto (13) keeps his eyes in the paint as he displays his ball-handling skills. UNC junior forward J.P. Tokoto (13) catches a pass in the corner from freshman forward Justin Jackson (44). UNC junior forward J.P. Tokoto (13) finishes a dunk. UNC junior forward Brice Johnson (11) throws down a dunk. UNC junior forward Brice Johnson (11) swings a pass to the top of the key. 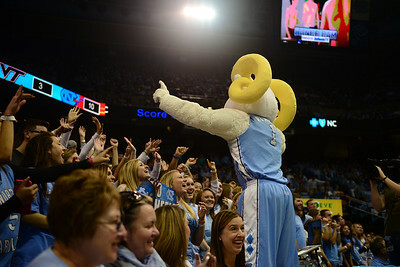 Rameses pumps up students in the crowd. UNC freshman forward Justin Jackson (44) and sophomore guard Nate Britt (0) combine for a block.